For the second consecutive year, the Neonatology Department at Schneider Children’s was accorded first place among 29 Neonatal Units in Israel by the Ministry of Health for 2018. In a report issued by the Ministry, issues such as the treatment of premature infants and advances in the care of the newborn are high on the Ministry’s list of priorities and much focus is therefore placed on these topics and their promotion. Based on this approach, neonatal departments and premature infants are defined as one of the Ministry’s flagship programs. The Ministry of Health graded the various neonatal departments according to a variety of parameters among which were the reduction in the incidence of acquired infections; improvement in professional staffing; additional job positions for nurses and for those who have specialized in neonatal intensive care; new beds; medications rooms, isolation rooms, and more. This year, the Ministry added several new parameters including continuation of care - community (meetings between parents and pediatrician); existence of resuscitation courses for staff and parents of premature infants; reduction of radiation to which the infant is exposed; breastfeeding and follow-up of hypothermia. 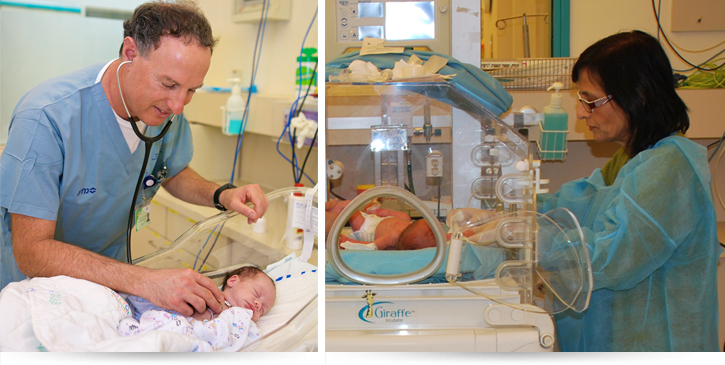 The Department of Neonatology at Schneider Children's headed by Prof. Gil Klinger is a tertiary care center for premature and newborn infants from all over Israel. About 1,000 babies are treated annually. Infants are hospitalized with a range of medical conditions such as complex respiratory disorders, congenital anomalies of multiple systems, congenital heart disorders, central nervous system abnormalities, disorders of the digestive system, chromosomal and metabolic disorders and very low birth weight infants.